More tracks to feast your ears on. This has to be one of the loopiest musical discoveries I’ve made all year. According to the Icelandic singer himself, this new single is ‘about a cheeseball doing all he can to get into a woman’s pants’. It’s set to a funky synthpop beat and is accompanied by the trippiest music video conceivable. I feel like a changed man after experiencing this song. Nothing will ever be the same again. Make sure to also check out the live performance on the Jools Holland show, which sees John Grant backed by a band inexplicably dressed up in pig masks. 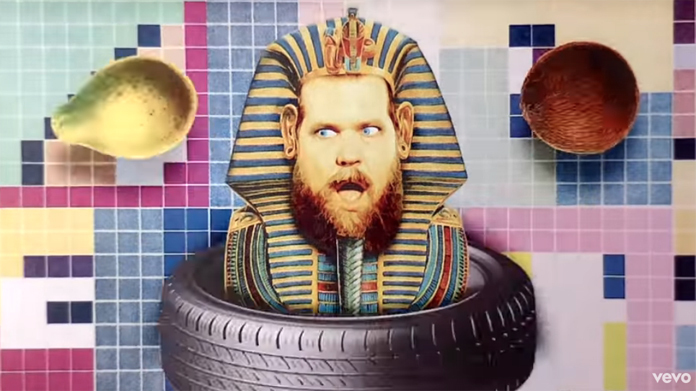 Once you’ve recovered from that John Grant song, you may as well take an electric ride with Pleasure Barge and continue your dose of eccentric funk. The Manchester-based disco-house band’s five minute funk odyssey cruises along happily before taking a dark turn, at which point it begins to feel like a ride on the Willy Wonka barge. I think the song’s probably an allegory for drug abuse (hence the floating pills making up the visuals), but even if you’re not interested in the lyrics it’s still a wacky and fun tune with lots of unpredictable progressions. Radiohead frontman Thom Yorke is scoring a horror movie and this eerie dirge is one of the songs making up the soundtrack. It could have been easy for the experimental singer to come up with something abstract – whilst this is largely Thom moaning over ambient synth swirls, it feels more like an actual song than I anticipated. In fact, I really love the plodding bass and drums which help to give it an ominous groove. Eccentric pop singer/producer Clarence Clarity and alternative hip hop artist A.J. Crew team up for this avant-garde concoction. The beat really does feel as if it’s bouncing off the ceiling and getting caught in the rafters, whilst A.J. Crew’s bars take a more cool and grounded approach. ‘Bear the Waves’ really does create the sensation of standing on a beach and letting the waves crash against you. I feel like a lot of indie bands aim for this dreamy beach vibe, but none nail it quite as perfectly as Stray Fossa have here. The guitars are so shimmery that you can practically swim in them. I really tried to like this - the experimental beat and Danny Brown’s verse are menacingly brilliant – but Alt-J’s vocals seem to be completely out of key with the rest of the song. Intentional or not, out of key Alt-J falsettos sadly lie beyond my threshold.